We recently shared with you the beginnings of a new landscape project in our garden–in other words turning our backyard into a drought resistant oasis. While we will share some of the more exciting details of installing a drip system at a later date, we thought it might prove helpful to list a few elements necessary for a drought resistant garden that will work in both residential and commercial applications. Hardy plants. While succulents may be the first type of plant that comes to mind, there are many plant varieties that are able to survive, and even thrive, in a drought. To name a few- recognizable plants like the Bird of Paradise, day lilies, California poppy, and even the beautiful and flowering hibiscus will add color and variety to a garden. Selecting plants that are native to your area or from a similar climate is a good place to start but check with your local nursery experts to find just the right plant species for your location. Irrigation. An efficient irrigation system is key to maintaining a beautiful garden at any time but especially during a drought or in a water challenged environment. The experts will be able to help you determine the right type of watering system for your area. Hardscape. Hardscaping is defined as “the placement of nonplant elements such as fences, walkways, paving, and lighting in a planned outdoor area.” Gravel pathways, for example, can replace large expanses of water hungry sod and small patios or seating areas will create little backyard “getaways” where you can enjoy a quiet drink, read a book or sneak in an afternoon nap. Shade. Shade is one of nature’s natural air conditioners. Even palm trees will provide a bit of shade during the day and that will keep any plants, and you, cooler. Personality. Drought resistant or not, every garden needs a bit of personality. 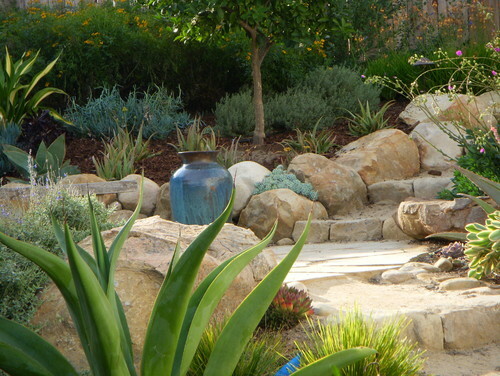 A beautiful fountain will provide the soothing sounds of water while a unique sculpture, hand-thrown pots or custom lighting will add ambience to even the smallest of gardens. To view our entire collection of architectural hardware and lighting, please visit our site at http://www.martinpierce.com. This entry was posted in architectural hardware and tagged drought resistant gardening, drought resistant gardens, drought resistant landscape, gardening during a drought. Bookmark the permalink.